Woodworking Talk - Woodworkers Forum > Shop Talk > Wood Finishing > Best way to finish douglas fir for outdoor bench? Best way to finish douglas fir for outdoor bench? I'm a newbie to these matters, and I spent this weekend throwing together the outdoor "bench" pictured below—basically just a 2 x 12 x 8 plank of douglas fir and a bunch of 3/4" pipe fittings for the legs. My question is: How should I treat and/or finish and/or stain the wood? I'm pretty much a complete novice when it comes to wood matters, so my only idea is to just give it a coat of Minwax or something, but I thought maybe I could ask you experts. Is it just as simple as that? Or am I missing something? I would love to bring out some natural tones and make it look nice as well as let it be durable in the outside sun and occasional showers. Plan to keep it outside all year long. I don't mind if, over time, it gets some natural wear and patina (or whatever the official word is). Just some boiled linseed oil is the way I would go. Lathering it on the fir until it doesn't soak up any more. Then wipe of the excess. One site that talked about finishing with the boiled linseed oil that you recommend also advised a second step where "then the entire table is then hand rubbed with wax." What wax is being referred to there and what does that do? Would you recommend that? One last thing: I am in Southern California, and I think I just read online that certain finishes/stains are outlawed here, so certain things I wouldn't be able to buy. I googled around to see examples of douglas fir coated in boiled linseed oil, and it looks pretty nice. That is all that it needs? That's all I would do. Put it on until it doesn't soak up any more. You could reapply with steel wool as an applicator to give a smoother finish. No need for some sort of poly-whatever as a second step? I wouldn't bother. The oil can be reapplied in a year or so if you feel the need. Not so easy with poly. You mentioned you like the natural/patina look. They may be referring to Briwax, Minwax or any other furniture wax or maybe beeswax polish. They probably recommend it to seal the oil and for appearance. BLO stinks to be blunt. And it does for a very long time. Nothing to be concerned about for outdoor use like a bench. The wax won't do much for protection outside and wouldn't last long. No harm in trying it if you like. Not sure if it's available there or not. It's cheap here and easy to find. There are a few tiny cracks in it, but at the lumber yard I worked with the guy to find an 8' piece that was pretty clean. Should I do sanding on the ends before finishing? You could trim the ends if they're big enough and you're really concerned. I wouldn't sand. The BLO will soak well into the end grain and protect it. That's just a neat idea of mixing wood and metal. I'm mostly a paraffin person for outdoor finishes. My second thought was to use socket weld ells until I saw the ridiculous price. 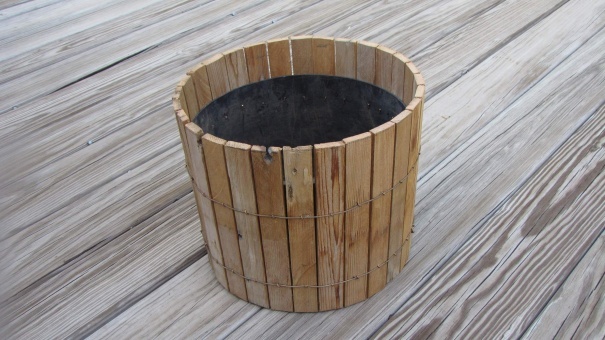 Now that you are hooked on wood working I have an idea for your planters of any size you like. The one pictured I made using a 5 gallon plastic bucket cut off. The slats on this one are about 1" wide X 1/4" thick cut from rough sawed salvage 1" X 12" western red cedar fence lumber that's about 50 years old. Yes sir, we could get that in those days. The wire and staples are copper. The staples were made using needle nose pliers, extend into the bucket about a quarter inch and bent flush inside using a hammer and anvil. My daughter keeps extending her hand as she leaves for home but I tell her I need it for a pattern for time being. She will persist and eventually get it I suspect. Last edited by SeniorSitizen; 08-05-2013 at 07:44 PM. If you want an oil type finish I would use an exterior tung oil. Personally I would put a spar varnish on it. I for sure would get the plants off of it before it gets stains from the plants on it. Thanks to all who responded! What a helpful forum this is. I ended up just getting a pretty basic, "natural" colored semi-transparent "exterior stain." I wanted to finish up this mini-project quick and easy this weekend, so that's what I went with. I don't think I'm a "woodworker" yet, since this one involved just laying a cut board over pipes, but I am quickly understanding the appeal. I've jotted down all of the different finishes that you folks mentioned as things to try out on my next projects, as I want to experiment with different finishes and form an opinion about what I like best. And, SandburRanch, thanks for the link to those cool wood containers you made. 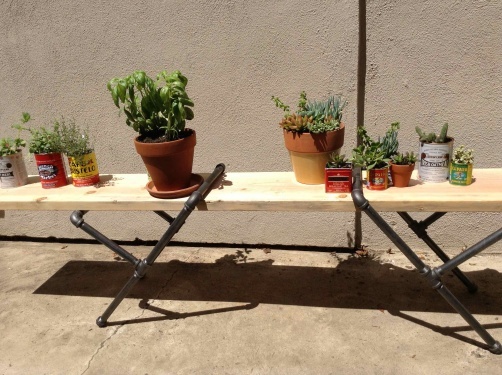 That looks like a perfect "next project," since we are looking for bigger containers for our basil plants!